Sorry not a very good picture - a better one can be provided if required. I've been on the lookout for a traditional 100W B22 (large bayonet fitting) LED bulb for a while. Hate the energy savers which a. take a while to reach full brightness and b. get dull with age. 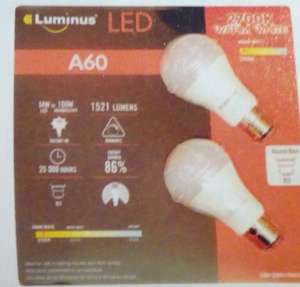 This bulb (2 for £7.78) is the warm light one, very good brightness, and comes on straight away. This pair is in the current Costco catalogue (runs to 29/1). Sorry if you don't have access to Costco. don't have access to Costco, but I think screwfix and tool station are cheaper. don't have access to Costco, but I think screwfix and tool station are … don't have access to Costco, but I think screwfix and tool station are cheaper. But that's £8.29 for one bulb only. [quote=shadey12] don't have access to Costco, but I think screwfix and … [quote=shadey12] don't have access to Costco, but I think screwfix and tool station are cheaper. cant remember a fashion show for light bulbs ? That's a hell of a lot of lumens ! These will be very bright , too bright for my needs for loft lighting ,I hate being blinded. I could have opted for the 15w version at £1.99 but thought that 900 lumens was probably a little excessive for my needs. I fitted a total of 6 points in the loft for lighting so I had a good spread of light without needing to go for the high powered blinding light a 100w or equivalent LED will throw at me. 1200-1400 lumens equates to the old fashioned 100w bulb.